For information on the Recreational Pipi Fishery, click here. 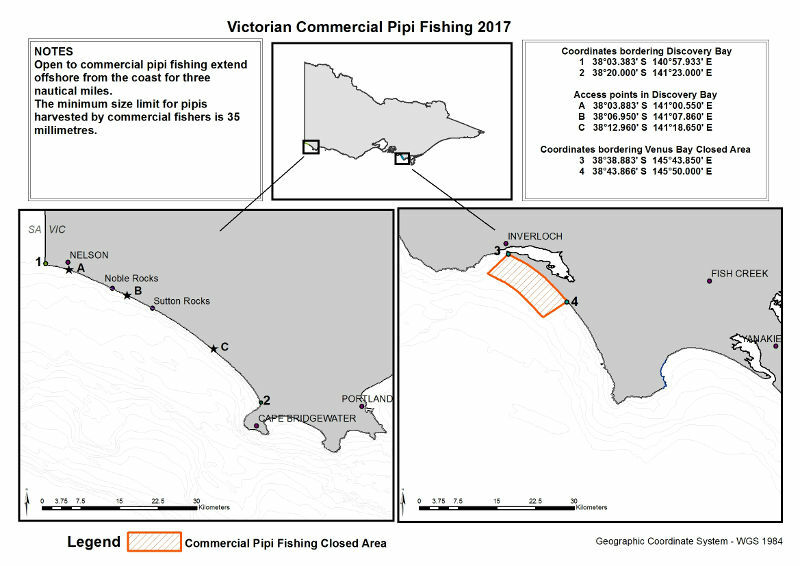 After undertaking consultation in accordance with Section 3A of the Fisheries Act 1995, the Fisheries (Victorian Pipi) Notice 2017 (the Notice) has been implemented for twelve months (unless sooner revoked). The Notice implements a set of management arrangements for the commercial harvest of pipis in Victoria by eligible Ocean Fishery Access Licence holders. The arrangements will result in a greater supply of fresh, locally caught pipis to the bait and food markets. The Notice does not change the rules that govern the recreational harvest of pipis. And a document responding to some key issues (PDF - 157.6 KB) raised through submissions received during the consultation period. For more information, please contact Dr Sonia Talman, Principal Policy Analyst, at GPO Box 4509, Melbourne VIC 3001 or sonia.talman@vfa.vic.gov.au. Pipi is the common name given to the small bivalve, Donax deltoides, which is found on high-energy sandy beaches in the intertidal zone. The Victorian fishery covers the entire Victorian coastline, with the exception of Port Phillip Bay and Marine National Parks where shellfish cannot be harvested in the intertidal region. However, the fishery is only currently open at Discovery Bay (targeted primarily by commercial fishers) and Venus Bay (primarily a recreational fishery). A number of licence classes are authorised to harvest pipi for commercial purposes, however, a majority of the harvest to date has been taken under the non-transferable Ocean Fishery Access Licences (OFAL). Fishers primarily use dip-nets to harvest pipis. Click here for more information on the Victorian Pipi Management Plan for 2018.